Text by Jan Van Adrichem. 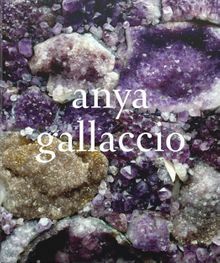 Anya Gallaccio’s ephemeral installations and sculptures over her 20-year career use nature’s uncertain qualities to embrace new forms and question contemporary society.British installation artist Anya Gallaccio works largely with natural materials – typically flowers, trees, sugar and salt – to create often site-specific installations which focus on the decomposition and transformation of the work itself.This monograph comprehensively catalogues the artist’s work over her 20-year career span. Alongside a full-colour plate section, the publication features a conversation between the artist and Clarrie Wallis, as well as new texts by Lucia Sanroman, who investigates the role of the landscape in Gallaccio’s work; Norman Bryson who analyses the notion of ‘psychic fantasy’ in the installation blessed (1999); Briony Fer who discusses the artist’s use of natural light and earth; and Jan van Adrichem who looks at Gallaccio’s move into bronze casts. Clth, 9.63 x 11.63 in. / 256 pgs / 200 color.